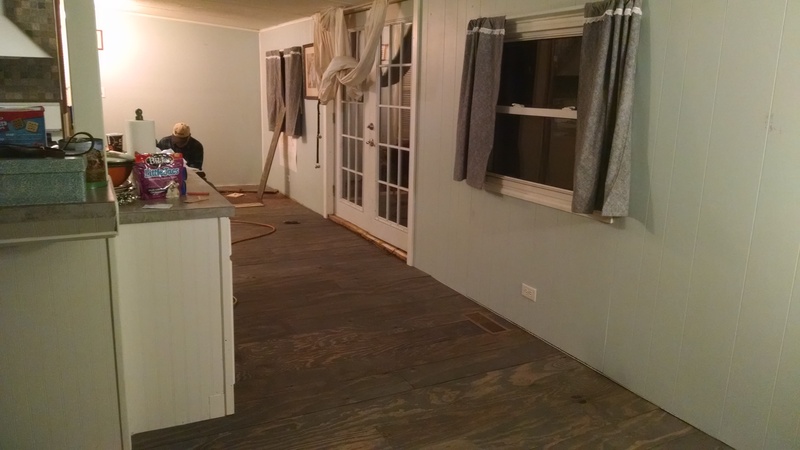 By the end of the week, we were definitely ready to put a period on the flooring project. We spent the week trying to walk on rugs and blankets to keep the floor clean and protected. 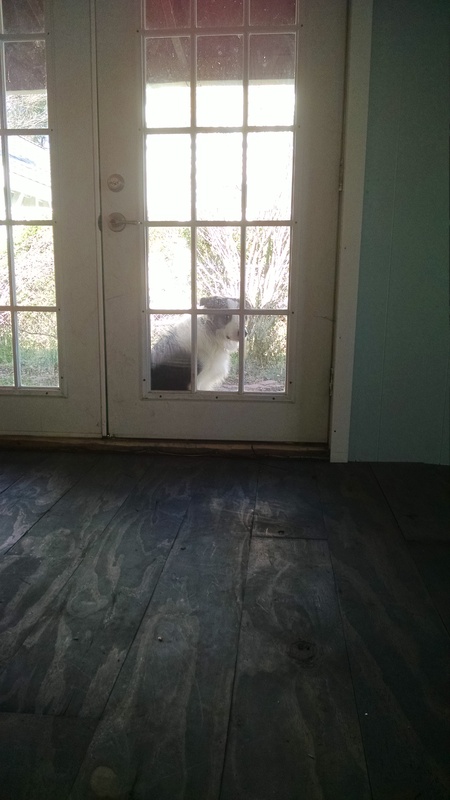 We’re adults, so it was aggravating but not horrific, but Waylon was confused and annoyed about the whole thing, especially since he basically had to stay in the laundry room or bedroom or outside. 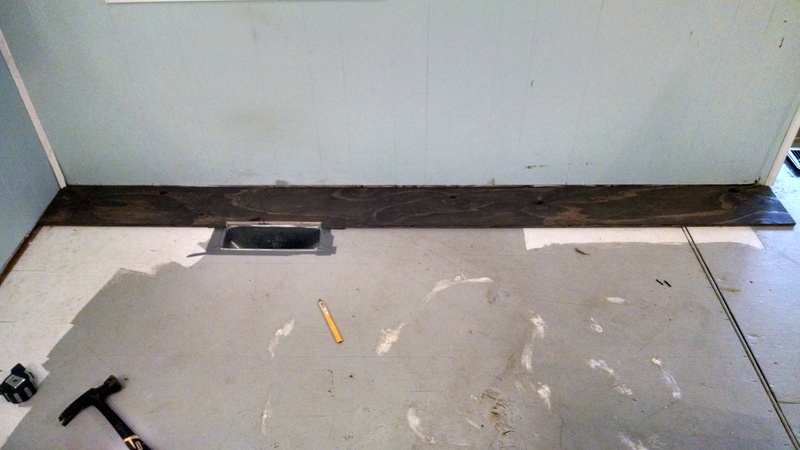 For the final coat on the floor, we used an oil-based polyurethane. 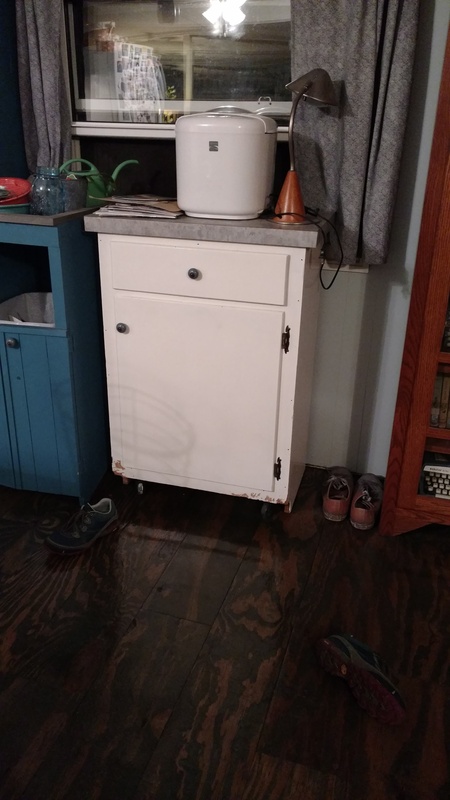 We were hoping that it would hold up better, and it has overall held up well (we at ten months of use now), but the oil base meant that it did yellow the stain, and because we blasted this thing with four coats, the yellowing was fairly significant. 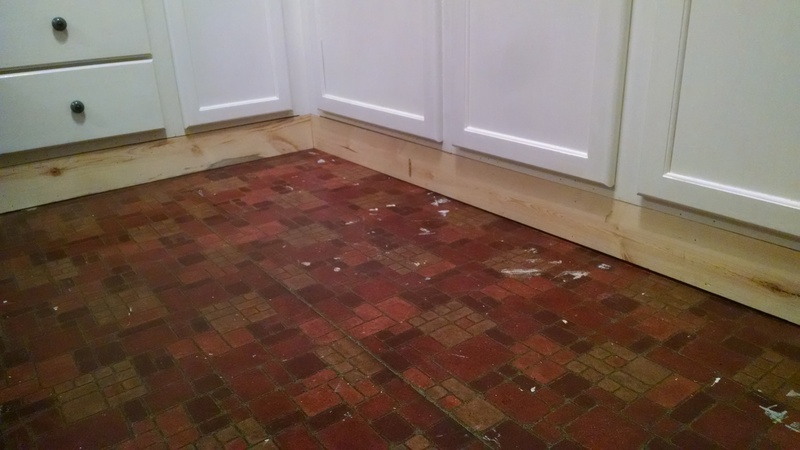 I think that I would use water-based if we did this project over, in hopes of retaining the original stain color. The actual application was pretty easy. 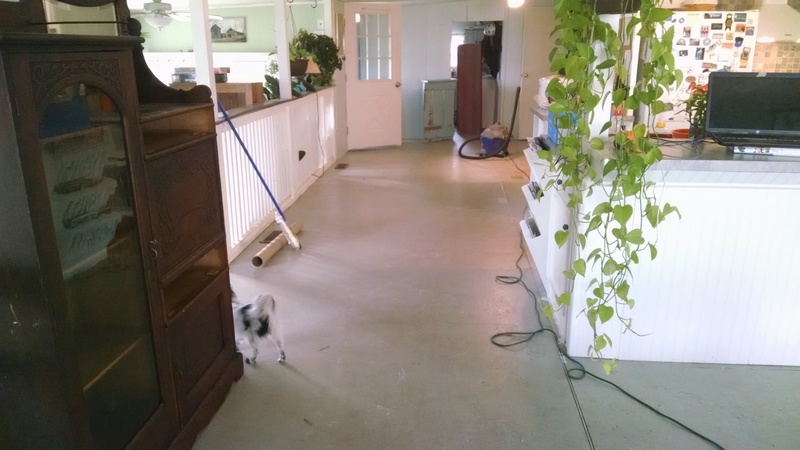 We thoroughly swept and vacuumed the floor, and then began working our way around the house and out the back door. We purchased an applicator that was basically a mop with a pad that could be attached, and we used that to spread the poly around. The poly that we chose claimed that sanding between coats would not be necessary. Our biggest mistake, I think, was that even though we allowed the required amount of time between coats, we really probably should have extended that time for each additional coat. It took a couple of weeks for this stuff to cure out completely. While we were able to walk on it and use it within a day of the final coat, we had to be very, very careful to not twist our feet as we walked, or it would immediately wrinkle up the top couple of coats of poly. This was still happening to some extent over a week later. It got to a point where I wondered if it would ever cure! So yes, we applied a coat, then had to go hang out somewhere else because the smell was unbelievable. By this time, it was the first weekend of December and quite cold, so we were leaving windows open and the furnace on – not terribly efficient. We had to stay two nights with relatives, and applied our four coats Friday night, Saturday morning, Saturday evening, and Sunday morning. 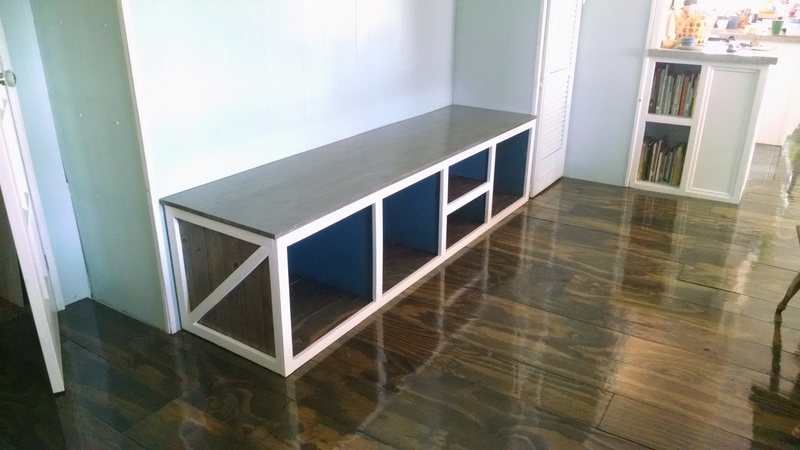 On the whole, the plywood flooring has been a win. Even though it didn’t end up being much more cost-effective than some of our other options, it definitely accomplished our goals of stiffening and leveling the floor. Eventually, we may put down laminate, but it should be able to blast right over what we already have. The poly has held up fairly well, once it cured. Waylon’s exuberance has definitely done a number on it and the floor is full of scuffs and scratches, but despite all his wild scramblings as he chases after balls, he has never cut down through all the layers to the actual wood. We were really concerned about the scratches at first, but honestly now it just makes the whole floor look warmer and more like an old wood floor. If this is something you’re thinking about doing, I think that the biggest thing we would change about the process is that we would have probably ended up with a smoother overall project if we had put down the wood and then rented a floor sander and sanded everything that way, and then stained it when it was already down. The dust would have been stupid, though, so maybe we did it the right way after all. 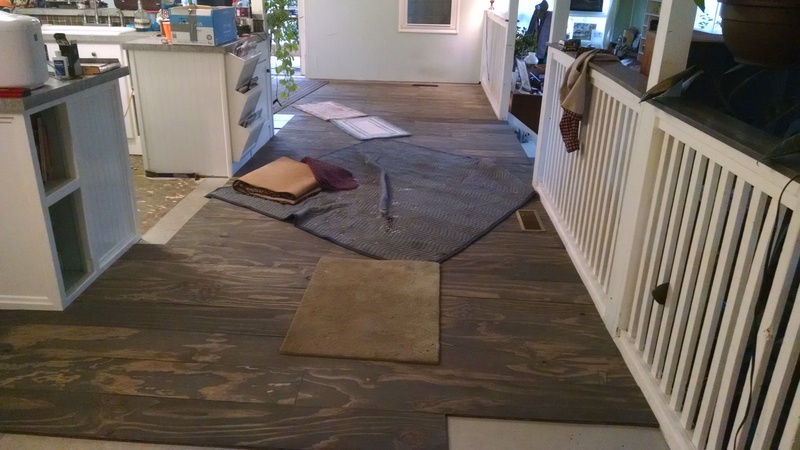 Overall, I love the floor, and it’s sooo much better than our gross subfloor! It was a ton of work, but the effort paid off! Next time – tile for the kitchen floor! So yes, the floor project was one of those that began to rapidly spiral out of control. 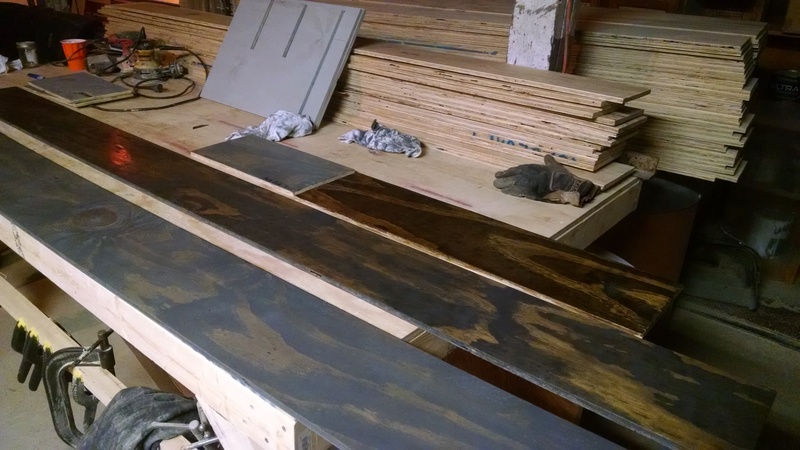 We put in quite a lot of man hours with the prep work of cutting, sanding, and staining. 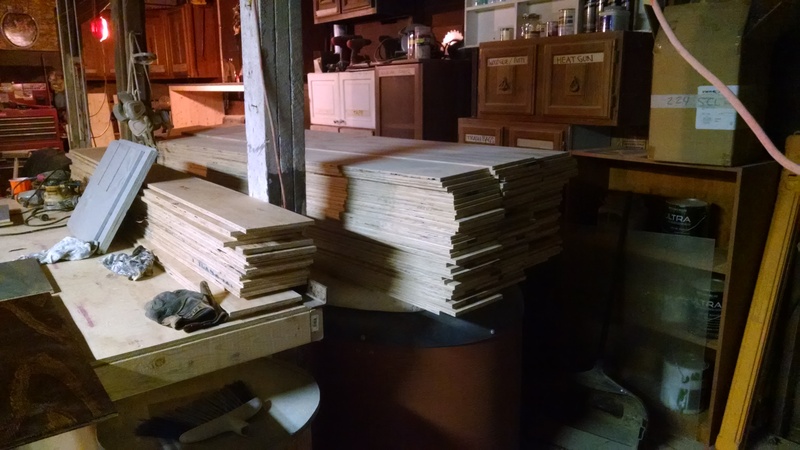 In the end, though, we had a huge pile of stained boards all ready to go. So here is a “before” picture. (That’s a friend’s dog in the picture… nothing like dogsitting while you’re doing major renovations!) Most of the house was, at this point, subfloor painted with grey floor paint. The floor paint held up so-so. At first, it was fairly easy to mop/clean, but the gloss wore off fairly quickly, and it just felt like the floor was dirty all the time, especially with Waylon tracking in and out everywhere. 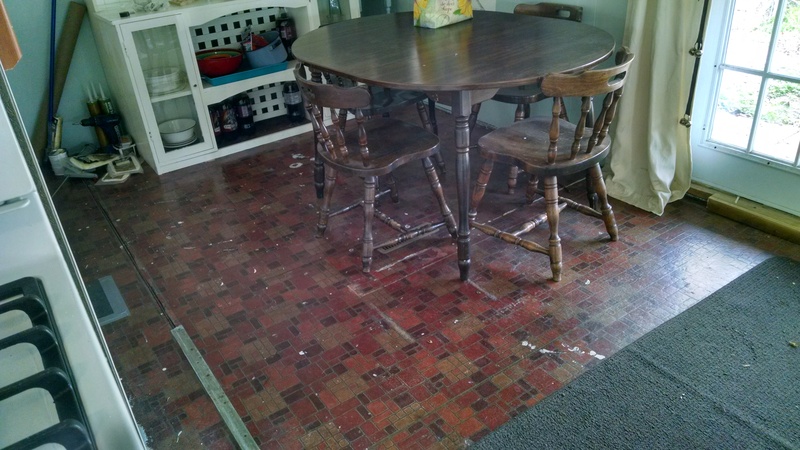 The kitchen, dining room, and part of the entry way had this lovely, classic faux-brick linoleum. 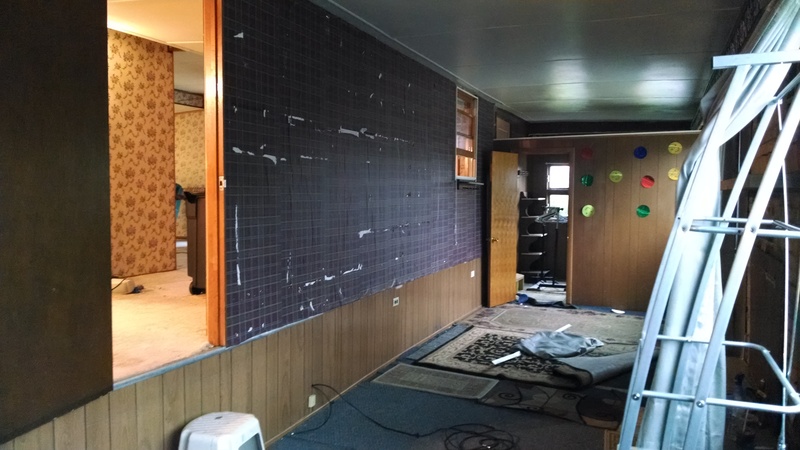 I had to take up the linoleum in the kitchen where we put down tile (more on that shortly), but for the parts of the house where we were putting down the plywood, we just blasted right over it. The house is long and skinny, so we wanted the boards to run the width, rather than the length, of the house. Otherwise we were afraid we would end up with a bowling-alley feel! In this picture, the weird crack on the right is actually one of those hinges that run throughout the house. 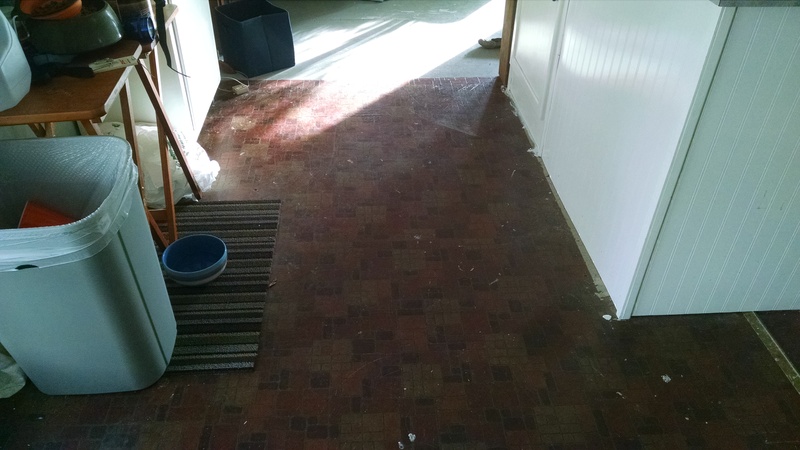 you can also see those weird white spots – those are where we stiffed the floor. In our house, under the subfloor is this weird honeycomb-cardboard stuff, and under that is another sheet of plywood. (From under the house, all you see is plywood.) In some places, that honeycomb is starting to break down, and those are the spots where the floor was getting spongy. We drilled small holes in the area, sprayed expanding foam down in them, and then (after it dried), trimmed off the excess. It actually worked brilliantly. Anyway, the main point of this picture is actually the putting down of our very first board! Genuine excitement. Once Pop and Tom figured out a system, it went down decently fast, but still involved a lot of measuring, cutting, and shimming. It was time-consuming. 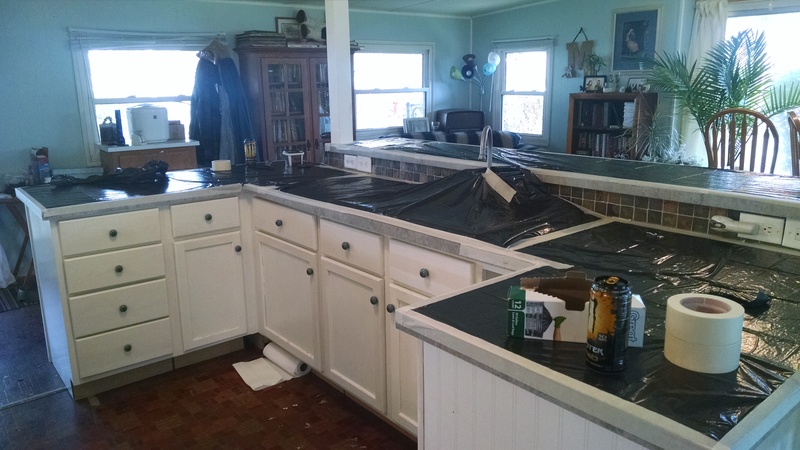 While they did that, I worked on taking up the kitchen linoleum. It was stuck. 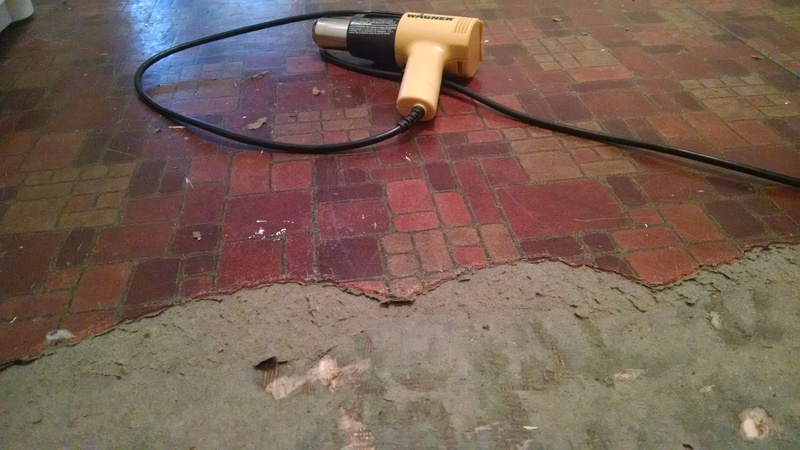 I used a heat gun to soften the linoleum, and then peeled it up using the multitool. Another project that was pretty slow going! It was pretty exciting to see the floor starting to take shape, though. At this point in the process, the floor isn’t very well protected, so we were walking on rugs and blankets to avoid tracking it up. We also had a bit of a hullabaloo because we had somehow underestimated the amount of wood we would need, which meant some extra cutting, sanding, and staining in the middle of the process! It took the whole weekend to get the floor down. Basically, we both glued and nailed the floor down. It’s pretty well stuck! At this point in the process, we had another work week ahead, and now we had to be extra careful on the floor, especially with Waylon. Next step – clear coat! So those of you who have been with me since the beginning will remember that way, way back when this whole adventure started, we had FLEAS. Not fleas, mind you, but FLEAS. EVERYWHERE. FLEAS. It was a horrific experience and still gives me nightmares. The actual point is, though, that at that time we were forced to pull up every scrap of carpet in this house. 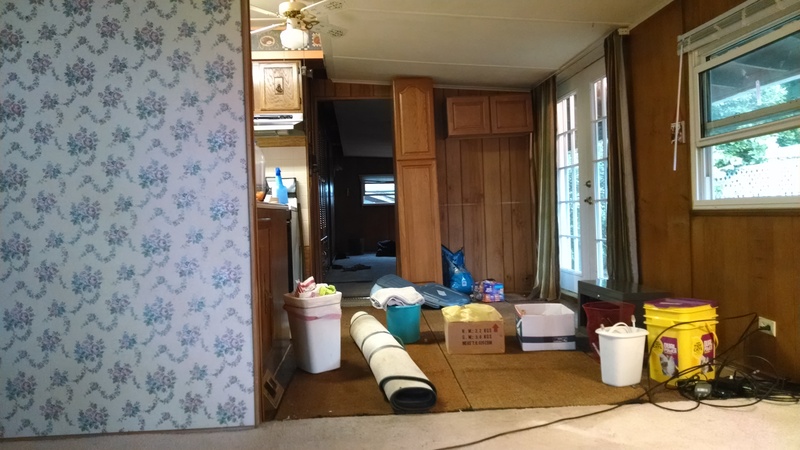 That had always been the long-term plan, but we were initially planning to just live with the old carpet until we decided what to do with the floors later. The FLEAS meant that we had to move flooring up the list. 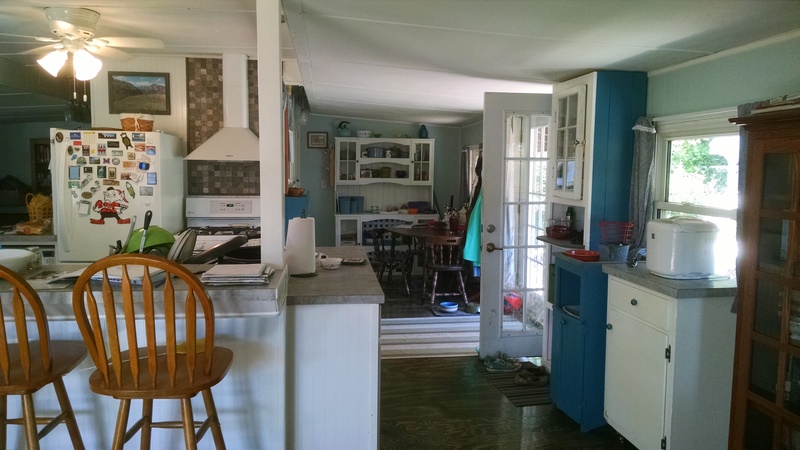 We took up all the carpeting and painted the entire subfloor with white primer paint – just like we were already painting on the ceilings and walls. The whole house was white for a bit. Later, we put down carpet in the lower room and also in the bedroom. However, on the whole, Tom and I both prefer hardwood floors (or wood laminate), so we decided to hold off on the rest of the house. So all of this background brings us up to last fall, when we were once again talking about various options for flooring this place. We had a lot of challenges. The three biggest? Because of these things, we didn’t feel like we could go with our top choice of throwing down laminate. We started kicking around other possibilities, and somehow stumbled upon some YouTube videos of people installing floor made out of plywood, which they cut into planks, sanded, stained, and polyed. And we began to think that maybe this could be a cost-effective way of doing what we wanted to do. Menard’s periodically (but randomly) has 11% off rebate weeks, where you can get 11% back on all purchases. One of those weeks came up in late October, and we decided that we would take the opportunity to go ahead and purchase all the plywood. Then we could work on the project throughout the winter, taking our time to plank, sand, and stain. The stack of plywood was rather staggering. Just looking at the sheer amount of wood it was going to take made me worry that we were making a mistake – because it was going to be a lot of effort to get that wood smooth enough to use as a floor! Now, Tom’s dad has been an invaluable aid to our whole life here, and we have depended on him heavily for advice, assistance, and insight, but every once in a while he turns into the catalyst that sets us off on a whole adventure that we were planning to do eventually but not right now. 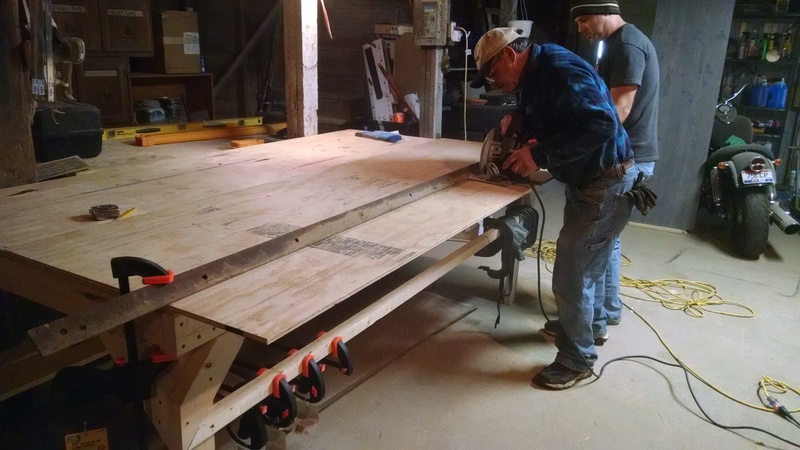 Once Tom started cutting the plywood into planks… the whole project spiraled rapidly out of control, per usual. Next, Pop rounded up a long piece of straight metal from somewhere or other. 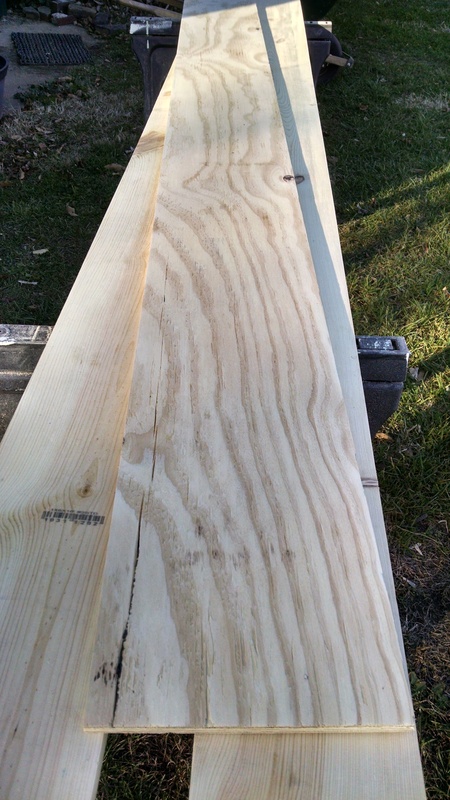 He and Tom clamped it down and used it as a guide to cut the plywood sheets into 8″ planks. This meant we had one narrow board left from each sheet, but we worked those into spots against the wall. It was AMAZING how fast the pile of planks grew! Meanwhile, I was outside the barn doing my usual thing – sanding. (Seriously, our little orbital sander is my best friend.) As you can see, the planks were pretty rough. 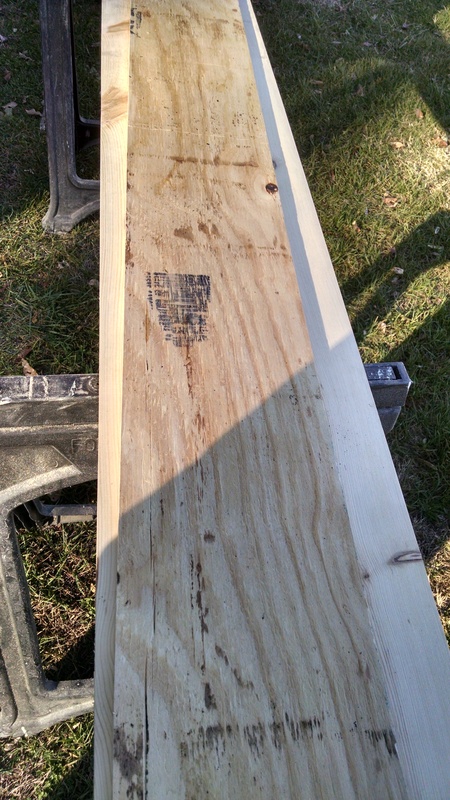 Plus, plywood tends to have a LOT of writing on it. It was a seriously challenging sanding project. 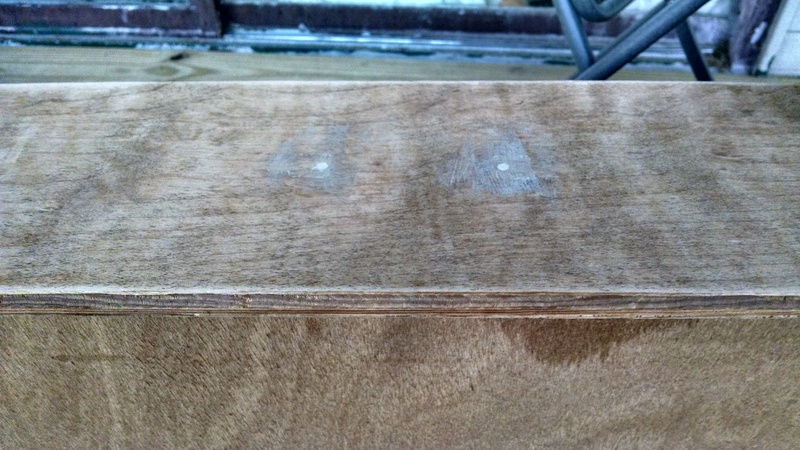 But, as you can see from the before and after pics, I was able (for the most part) to get them sanded down. However, that process was super, super slow, and the pile of planks looked virtually endless. 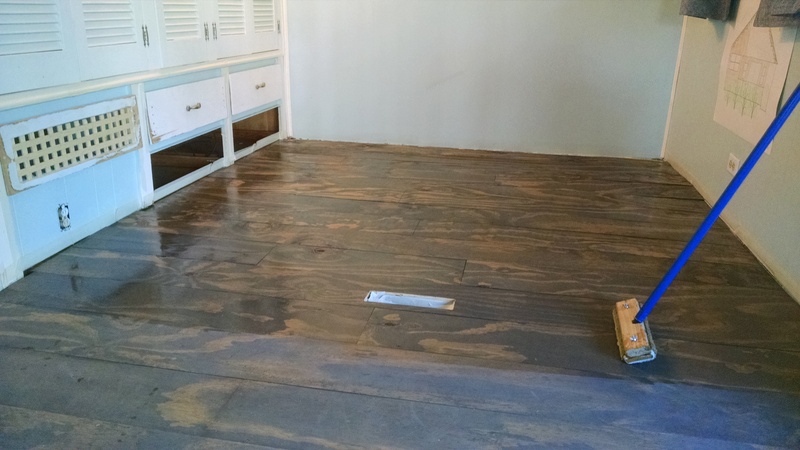 This was the point in the process when we began to realize that this was a cheap way to do the floors… as long as you consider your own labor to be valueless! Luckily, Pop stepped in to save the day as usual. 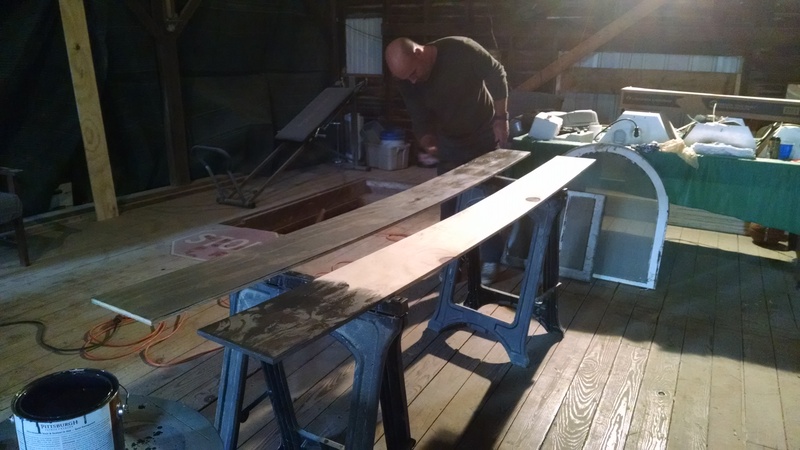 He spent almost two full days sanding on these planks! Ridiculous. In the end, we went with a very dark grey, almost black, stain called called cinder. We spent the entire weekend before Thanksgiving staining planks in the upstairs of the barn. It was one of those endless tasks where you just crank up the music and go on forever. The planks had to be stained on the top, and then on all of the edges, because we knew that there would be small gaps between the boards at times. 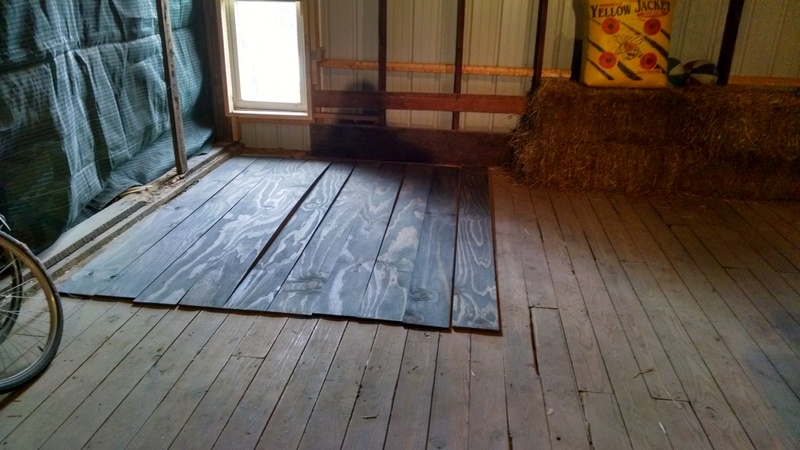 As we finished staining them, we laid the boards out in the upstairs of the barn to dry. The boards actually looked pretty good stained, although it took a lot more stain than we initially thought it would, and I had to make an emergency run to Menard’s! By this time we were two weekends in, and were planning the big installation for Thanksgiving weekend… to be covered in the next post! In the house where I grew up, there was a small cabinet in the kitchen. I think it may have come from my great-grandma’s house. It was on wheels, even though it never really got moved around, and Mom stored baking supplies in it, and kept her bread maker on top of it. Somehow, when I moved into this house, I ended up with that little cabinet. And then, for Christmas last year, Mom gave me a bread maker – and guess where I put it! 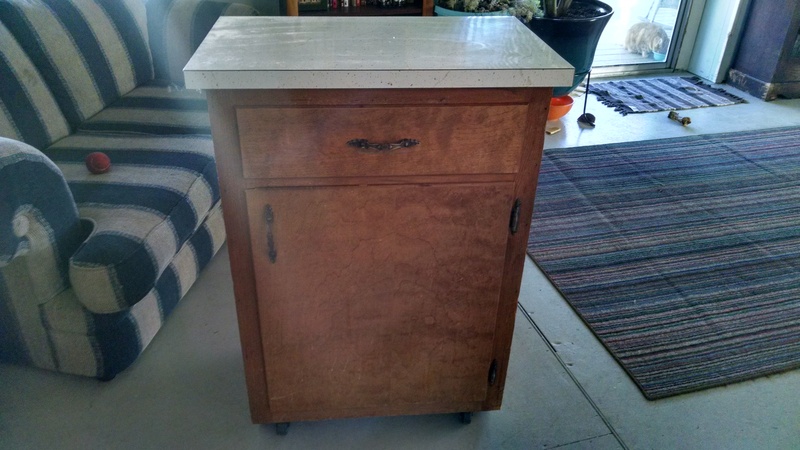 When we redid the kitchen, I knew I wanted to keep this little cabinet around – preferably with the bread maker still on top – but it wasn’t really going to match at all. Mom gave her blessing on refinishing it, as long as I took “before” pictures, and last fall I did just that. This was a fast and easy project that really made a difference to the cabinet. The “before” picture shows you that this isn’t a real heirloom or anything like that. But it’s sturdy and well-made. First of all, of course, came the sanding. There wasn’t a very a heavy gloss on the cabinet, so the sanding wasn’t too intense. I did decide that I wanted to use my blue knobs instead of reusing the hardware that was on it, so I had to putty in the holes and sand those down as well. Next, I painted the whole cabinet with the same glossy white as the kitchen cabinets. (Although I apparently didn’t take a picture of that stage.) Even though I didn’t really need to (since I didn’t on other cupboards), I went ahead and painted the inside of the cabinet as well. The inside had never been varnished or anything, and I wanted it to be easy to clean. Nothing wipes out like a few layers of full-gloss paint! For the top, we had some leftover laminate from our countertops. Tom glued it on. 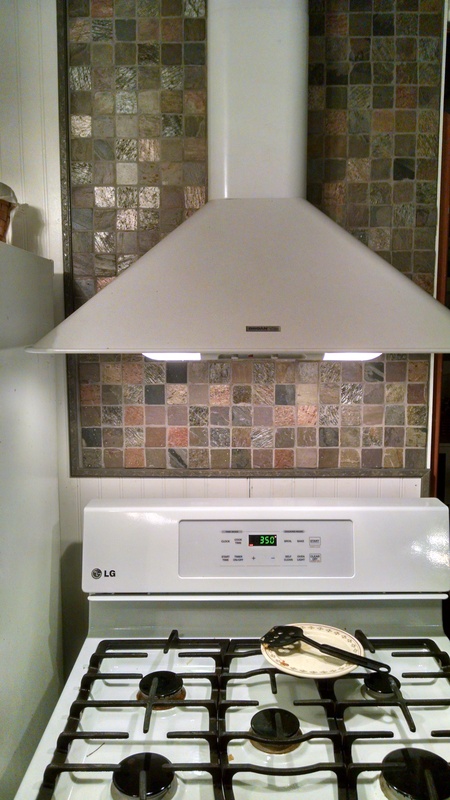 The edges of the cabinet’s counter are square just like the counters in our kitchen, so the edges were no problem. All in all, a very satisfactory heirloom. So a LOT of projects around here get done slapdash. There are just so many things to accomplish, that sometimes it’s easier to just do the bulk of the project and then jump to the next thing. Slowly, we’ve been trying to keep ourselves focused and actually finish stuff – or at least get it a little closer! While the bulk of the kitchen remodel happened last January/February, we are still doing random little things to make it better. What’s amazing to me is how little details really do tighten everything up and improve the entire experience. 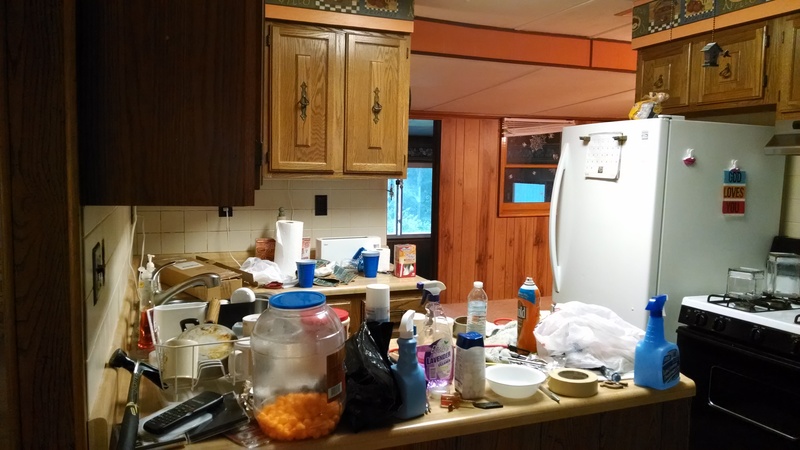 Last November, we hit several smaller parts of the kitchen that took it from looking half-finished to actually looking like we had gotten somewhere! One of the most basic items – knobs. I lived without them for months and got along just fine. Part of the problem was that I really had trouble finding something that I genuinely liked. 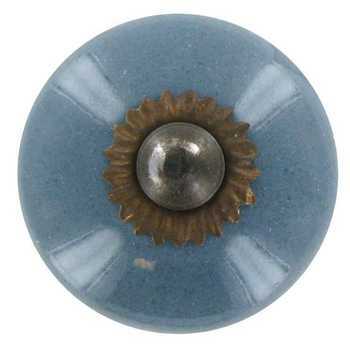 And since knobs are weirdly expensive, I wanted to find something I really liked before I parted with the cash! While I like our white cabinets a lot – and they definitely brighten up the kitchen – I was hoping to find something with just a touch of color for the knobs. After scouring all the home improvement stores (Menard’s, Lowes, Home Depot) and coming up empty, I was one day randomly wandering through Hobby Lobby and realized – they have tons of knobs! And that’s where I found the ones I love! They are blue and not too tiny or too big, they’re ceramic, and just plain adorable. I love them! I waited until they were 50% off and bought a slew of them, as I wanted them not just in the main part of the kitchen, but also on the pantry doors, the hutch in the dining nook, and the other shelves that were going to be built/remodeled along the north wall. All in all, I still really like these knobs, now that we’ve used them for almost a year. However, that little ring is made of very sharp metal, and they easily bend out of shape. That means that they catch easily on clothes, and I’ve even cut my finger on them! So I’ve been taking the knobs apart, removing that ring, and then putting them back together. The knobs aren’t quite as cute that way, but at least they aren’t endangering lives any more. 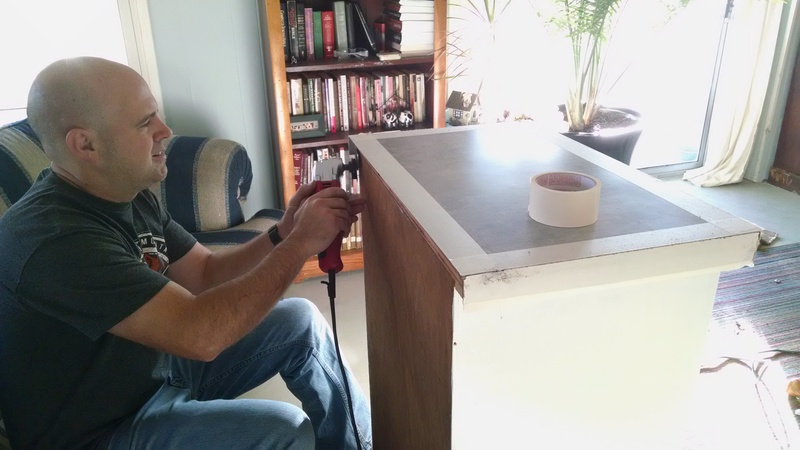 Before installing the knobs, I also wanted to put a final coat of paint on all the cabinets. Some of them had only gotten one or two coats, and they really needed three. 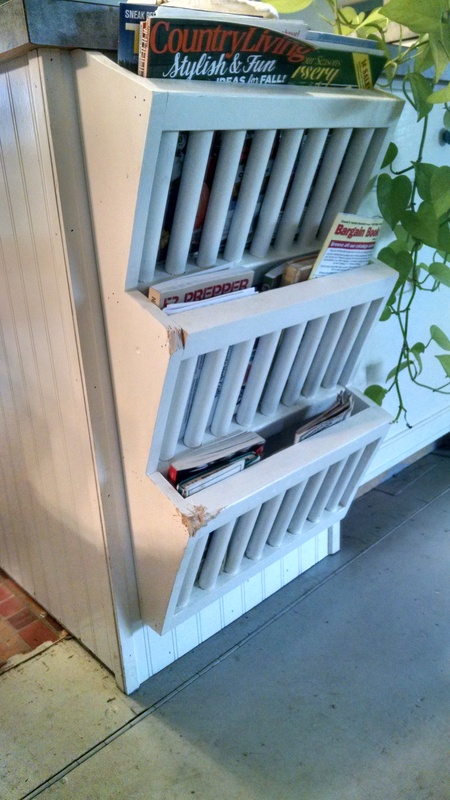 Because we started with unfinished cupboards, they had also been a smidge rough. I really ought to have sanded them before painting them initially, but, you know, water under the bridge. Instead, I gently 220’d them before applying the final coat of paint – it really made a big difference. Generally, when people install cabinets, the cabinets all face the same direction. 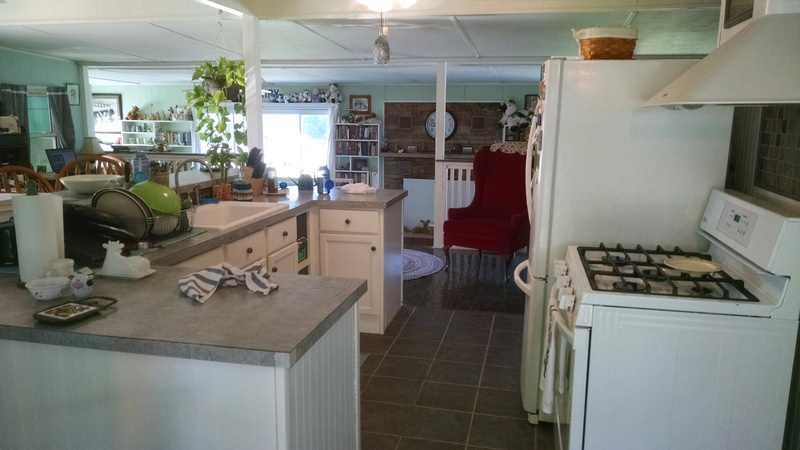 However, because our kitchen is an island, I decided that in order to fully utilize the “dead” corners, we would use corner cabinets – that face out. It’s worked fabulously, but one thing I hadn’t thought about (although Tom had, of course, and had already mentally solved the issue) was that this mean that all of the toe-kick space didn’t line up. 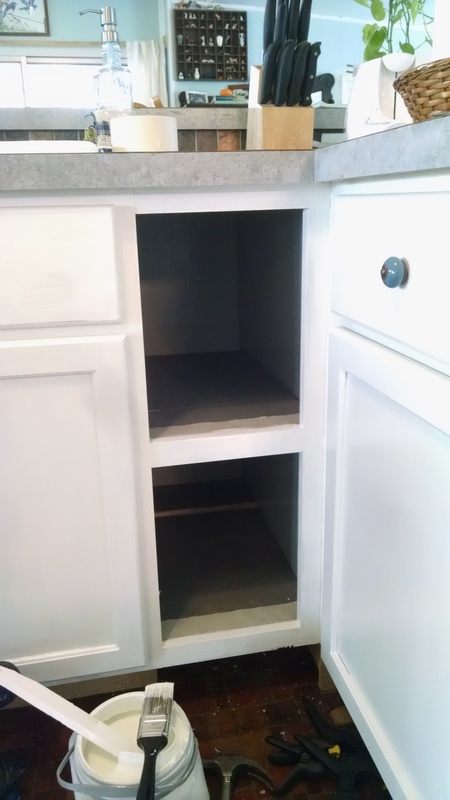 In order to fix this, Tom decided just to eliminated the usual toe-kick space entirely by faceboarding everything flush with the front of the cabinets. Initially, it seemed a little weird, but after they were painted, the boards blended right in. I haven’t noticed any difficulty in using the kitchen without that extra space for my toes. Knobs, fresh paint, some putty/sanding/painting on other trimwork, and tidying up the bottom of the cabinets all made a big difference. We also put in a shelf that was in a little dead space near the sink (perfect for the toaster and other items that tend to clutter the counter), put some trim around the tile behind the stove, and Tom installed a homemade magazine rack on the outside of the island (pictured here with Waylon damage lol). So I posted briefly in June with some throwback pictures. I mentioned then that I have been working on a massive project – organizing all our photos. What with having phones that are cameras, we accumulate a LOT of pictures nowadays, and I was frustrated with the fact that they were all jumbled up because they come from different sources, so when I put them on the computer they aren’t really organized at all. I also think this laptop has a limited amount of life left – it’s doing that thing where it goes super sketch for a few days and then comes back around, and it never charges past 95%. So I was getting a little concerned that it was just going to crash one day and all my pictures would be gone. But before I just stuck them on a flash drive, I really, really, REALLY wanted to get them organized. For inquiring minds, I’m labeling the photos by date and time. So I I took a picture right now, on September 17, 2016, at 8:58pm, the picture would be labeled “2016-09-17-2058.” By doing this, I am able to easily combine pictures from different sources into one folder. It doesn’t matter if the picture was taken on my phone, Tom’s phone, our camera, or came from someone else – as long as they all get labeled in that manner, putting them in the same folder means they automatically sort themselves chronologically. I also discovered that just regular old Windows photo program allows me to “tag” pictures, so I have also been able to organize them that way, by giving them (probably way too many) tags that I can use to search for specific pictures, events, places, or people. It’s honestly taken me a lot of the summer, working on this project in my spare time, to get it all together. There were hundreds of pictures to go through, especially since we bought the house and I went a bit picture-crazy trying to keep a record of everything we’ve been doing! But now that I’m somewhat caught up, I would like to try to get back into blogging again. It helps that even though we are always working on projects, the pace has somewhat slowed as we’ve taken care of the majority of things that were giving us an automatic gag-reflex every time we saw them! We’ll see what happens. I’m working part-time again, and there are a lot of things going on around here – plus we’re going on vacation soon!!! – but I really like having this blog as a sort of scrapbook of our lives, so it would be nice to get it operational again. Here’s hoping! So I know that I’ve done a really poor job keeping up this blog – life, you know?? But I am currently working on a massive photograph-organizational project. 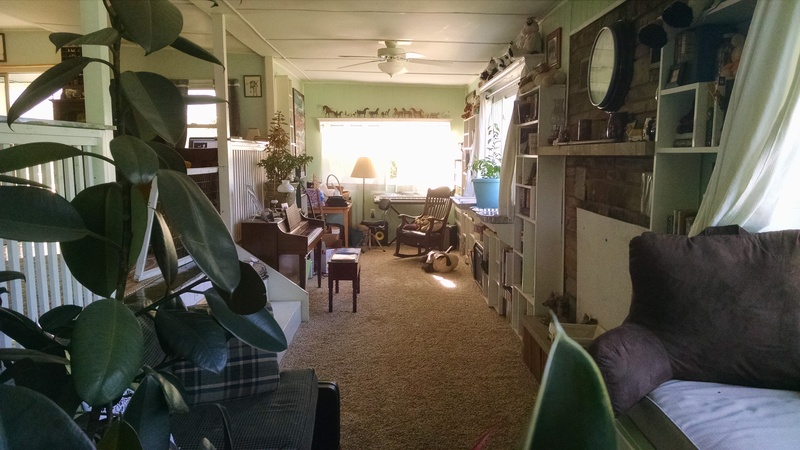 When that’s completed, I really do want to update this blog on all our progress, because we have been doing a LOT, including screening the front porch, planting a huge vegetable garden, putting up a new fence, putting down real flooring, etc. But in the midst of sifting through hundreds of pictures, I came across these pictures, taken on June 8, 2014. A lot has changed in two years, and sometimes it helps to remember the progress! It’s hard to say which view has changed the most! The last two years have been really intense, but we are making progress, and the back porch, the back corner/closet/laundry room/bathroom remodel, the windows, and the fireplace are the only big projects we have left. All in all, things are coming together and this house is turning into a happy place (now that we’ve eliminated half the walls!). Hopefully more detailed posts will come sometime soonish!